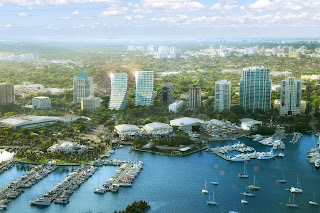 Brand new pre construction project in COCONUT GROVE. Located on the what was the ONLY 5 Star hotel site in Miami - The Grand Bay Hotel situated on the distinguished South Bayshore Drive, with over 1.2 hectares and 100 meters of frontage overlooking Biscayne Bay our towers dance and twist in a motion to allow the views to be from Biscayne Bay to the east, Downtown Miami to the North and Coral Gables to the South. Enlisting the services of Bjarke Ingels of BIG to design the towers, has given this property the provenance that it deserves. Bjarke is the 2011 Wall Street Journal Innovator of the Year award winner. The services for our home owners are including - Butler Services, Onsite chef, Spa and treatment rooms, Club Room, Dining area, for residences that are purchased over 4,000sq ft the owner will have a 2 car climate controlled garage within in the main garage (with privacy for their personal cars with either the ability to self or valet park) all other residences come with 2 car spaces within the garage facility. Additionally our garages create our terraces that over look Biscayne Bay and are only 2 levels. The residences will be finished in a "Decorator ready" state where our kitchen and bathroom cabinetry purveyor is Snaidero, and the appliances will be the Miele Collection, The stone flooring in the bathrooms will be delivered by the developer and that is being finalized by BIG. This will be the only sustainable residential tower in South Florida - meaning we are a "Green" building and will attain Silver LEED Certification. Raymond Jungles and Bjarke Ingels will be working in collaboration on the landscape architecture for the property. BIG (Bjarke Ingels Group) will be coordinating all the interiors of the tower as our Interior Architects as well as the outside building architects. As you can see, I can continue to write many more items about the property, so please feel free to contact me with questions about the residences that we have for sale. Our North Tower which has 58 residences has been reserved with 35 sales so far, and that is since our launch on March 23. We have a nice cross section of residences still for sale on all different levels low, middle and high elevations and of all our floor plans.